Troy Edmonds is a facilitator of leadership and coaching programs with Airbus in the Australia Pacific region and recent Prosci Train-the-Trainer graduate. Prior to his time with Airbus, Troy was a helicopter maintainer with the Australian Defence Force and technical trainer. After being certified through beinghuman, a Primary Affiliate of Prosci located in Australia, Troy and his manager determined a critical need to internalize change management. To accomplish this, they identified the Prosci Train-the-Trainer Program as the path forward. Troy, as you reflect on the Train-the-Trainer Program that you attended, what realizations are you left with following the program? For me the Train-the-Trainer Program cemented the importance of addressing the people side of any change, whether that be because of a project or not. I returned to my workplace with a great enthusiasm to share the tools, processes and methodologies with anyone I could get into a program. I also got to work with some great people in the course from all over the U.S. Being from Australia, having this network as well as now building a more local network has been great. You completed Train-the-Trainer in March and began training shortly after in May. Getting the training coordinated this quickly is no small effort. How did you go about securing budget & sponsorship for a program in such short order? I ordered my first set of materials whilst I was at the Train-the-Trainer Program. I was pretty much all set up for the first session prior to attending. I sent out an email to a range of management levels across our organization to get an indication of the interest level. This clearly identified need for structured change management training, most specifically from team managers. Our first order was for the Change Management for Managers Program. The original budget for this first program was provided by our Learning & Organisational Development group and with support by our great administration team to ensure we were able to start very quickly. As for sponsorship, I was fortunate that my direct manager, as well as the Vice President of People and Workplace, had already completed the Prosci Change Management Programs and could see the benefits in having the ability to conduct a range of Prosci change management trainings internally. The VP of People and Workplace opened the sessions and shared his experiences with change management both in other industries and within Airbus. What were your key considerations in determining your audience? I have focused our training on two specific areas so far: training for the Managers of our people and for Project Managers. For the Change Management Program for Managers, it is important that the attendees have teams that they can work with during the pre-work, and that they are going through a change that is real. This ensures the learning has real benefits after the session. It is similar with the Delivering Project Results: Workshop for Project Managers. The attendees need to bring a real project with them. What were some of the tactics you used to build awareness for the training with these groups before training? We sent out a flyer to the business around six weeks prior to each session. The flyer gives potential participants a breakdown of content, clearly defines the target audience, explains the pre-work requirements and provides a point of contact if they have any further questions before nominating themselves for the session. We also build awareness during our Leadership Programs, where we introduce change management and inform the participants about the range of Prosci change management courses that are now available inside the company. What tactics did you employ to build desire among the participants for attending the program? For the Change Management Program for Managers, the main message I employ is around that of looking after our people. Most managers understand the benefits in ensuring the people in their teams engage in changes in a positive way. More importantly, they care about their people, so they want to ensure they do what they can to help them through change. For the Project Managers, the discussion is around the golden question: “how much do the results of the project depend on people doing something differently?” Although it seems like a simple question, this is the one that really gets them thinking a bit differently. Of course, both groups have been involved in, or seen change done poorly, so it is an easy sell. What successes that you have had do you think would be replicable by anyone in any organization? I would suggest pre-loading key people with the importance of change management prior to rolling out the program. That way they are lining up when it is time to schedule the first session. Are there any questions you dread getting from participants? The question I am dreading now is, “where do I go for a Change Manager to support my project?” We are scheduled to run some Change Management Practitioner Programs by the end of the year, but at present, we have not established a pool of resources large enough to support the Project Managers that come to the programs with that desire to engage. Did you foresee any challenges for your participants in bringing the classroom learning to life in their day-to-day work? As with any training, I guess the biggest challenge is to keep that desire alive long enough for this new way of thinking to take hold when everyone returns to daily jobs. I think it will be better supported once we get more practitioners tied back into the business. How do you plan to continue to support your participants after the program? What expectations do you have of participants of your programs? I have been contacting the participants a few weeks after their program to see how things have gone with any actions they have taken away, along with discussing any challenges they are facing. With the Program for Managers, I also get each participant to partner up with someone else and hold their partner accountable for any actions they are leaving the program with. Have you seen any immediate impacts from the trainings on your participants? Yes. In fact I had a participant in a Program for Managers that turned out to be the sponsor on another project I am supporting. When we were looking at the communications plan, the sponsor was ahead of the game. They had developed a plan on what was to be shared, by whom and when. They also insisted that they were invited to each information session. Perfect approach from the sponsor and all because of attending the Program for Managers earlier on. 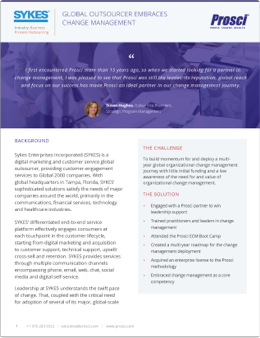 Any thoughts about running a Prosci Change Management Sponsor Briefing? I would love to run one. Whenever I have someone in a program who might be a sponsor, I really try to hammer the importance of that role in that program. I think next year we’ll try to get to the Director and VP levels with this program. If you could share one tip with Train-the-Trainer graduates preparing to facilitate their first program, what would it be? Before you start to conduct your programs, it would be to prepare, prepare, prepare. Know the material well and bookmark the Prosci Best Practices in Change Management research report as this will help with those questions that just move to the outside of the scope of the content being delivered. Use the experience in the room in a true facilitation fashion. Draw out what has worked and not worked from the participants to help the learning be as real as possible. Looking for more success stories on change management? Download a success story on the role training played in building change capability at another global organization below. Client Success Story: SYKES Enterprise, Inc.